Home ownership. You’ve been dreaming about it for years. You’ve even been watching home shows featuring design transformations and now the time is finally right to buy your first home. Congratulations! The best part, of course, is the house hunting stage where you have a chance to visit a multitude of properties and see how they fit with your list of “must haves” to create a place you can call home. When it comes to windows, first time home buyers find these three features particularly attractive. Keep them in mind as you search for the perfect space. Ample space to entertain ranks high on the list of what new home buyers find appealing. If you’re coming from an apartment or rental situation, the opportunity to host large gatherings for friends and family can be very desirable. Open concept floor plans that allow guests to move freely from the inside to the outdoors is key. 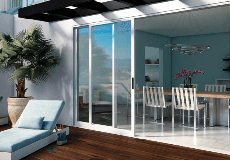 Moving glass wall systems or sliding patio doors accomplish that goal, helping make a space feel bigger than it is, and offer flexibility in the way a space is utilized. Beyond aesthetics, comfort is an important factor for homeowners. It’s probably a given that you’d like your home to be warm in winter and cooler during the summer months. Windows and patio doors that have dual pane glass and Low-E coatings help provide more consistent temperatures all year long. Look for windows with ENERGY STAR® ratings. This shows that a window or patio door meets U-Factor (rate of heat loss) and Solar Heat Gain Coefficient (amount of heat transmitted) criteria for your local area. Research shows that over the course of someone’s life they will purchase windows once, maybe twice. With that in mind, you’ll want the windows and patio doors in your new home to be reliable and require low maintenance. Frame materials such as fiberglass or vinyl are engineered to be impact resistant which helps them to be less likely to chip, reducing the need to re-paint over the years. Plus, they come in a variety of designer colors. Milgard offers a Full Lifetime Warranty to the original homeowner who purchases their products. This provides peace of mind that repairs and service are included for product defectives as long as they live in their home. Buying a home is still considered part of the American dream. If homes you are looking at do not contain these features, consider remodeling with replacement windows and patio doors. Plus, if you choose a fixer upper, you can create a home that mirrors your aspirations and fits your vision perfectly. Please get new dealers in Dakotas. Discover just how affordable Milgard Windows & Doors can be. Sashes + Glass is a blog developed to guide you through the window and patio door buying process. From frame style to color, we want to help you set the tone for your house with beautiful windows in the hope that it will bring joy to your living space.